Danielle and Andrew had their ceremony at one of our favorite churches, Our Lady of Victory in Lackawanna, NY. We try and take advantage of every part of the church for photos! We stay as long as we can too! We photograph a lot of weddings there, so we always want to create something new and one of a kind for our couples. Neal has always wanted to use the back of the church for photos. Technically, it would be the front of the church where you walk in. But everyone considers the altar as the front. There is so much detail in the Basilica. The ceilings are gorgeous! We had the bride and groom stand in the doorway and have a kiss. We made sure all of the guests were cleared out in the front and we opened the doors to let the light in! It was really bright outside and the light was pouring in. The photo was edited a little darker in the church. 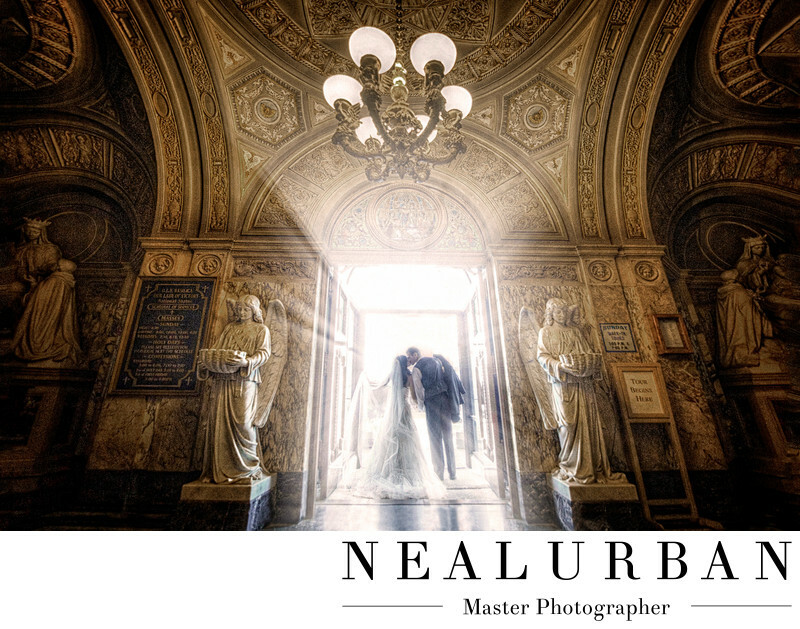 Neal really wanted the bride and groom to be in the light! They were taking their first steps out into the world as husband and wife. What better way than to seal it with a kiss on the way out! Danielle and Andrew had their reception at Brookfield Country Club in Clarence, NY. This was another amazing venue for photos! Location: 767 Ridge Rd, Buffalo, NY 14218 .